LA MIRADA — You never know which way the ball will bounce in soccer, and for La Mirada High School’s boys team, it was deflected in the wrong direction on Friday. 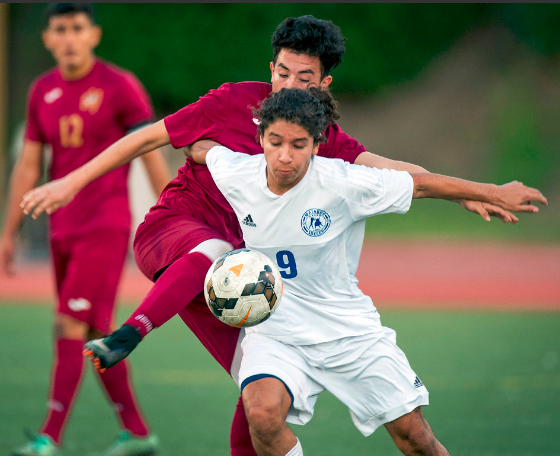 The Matadores, despite dominating most of the play against visiting Bellflower, fell 1-0 to the Buccaneers in a Suburban League game at La Mirada High. The setback now puts them in an uncomfortable position in a quest for a CIF Southern Section playoff spot. Miguel Garcia scored in the second minute for Bellflower, which remained in first place at 10-6-1 overall and 6-2 in league play. La Mirada, which outshot the Buccaneers 13-9 slipped to 9-7-3 and 4-2-2. The Matadores are now in fourth place, with the likelihood of having to sweep their final four games. La Mirada was put there after Garcia broke free moments after the opening whistle. He dribbled down the right side of the penalty area, firing a shot to the left of Matadores’ goalie Isaac Barajas for the lead in the second minute. The Matadores peppered the net for the remaining 78 minutes but couldn’t sneak a ball past Bellflower’s Jordan Jacobo, who had five saves. They had three solid chances in the second half, including two headers by Sanchez, who twice deflected cross passes from Ryan Candelario high from inside the penalty area. The second attempt came in the 79th minute.